T-Ball sign-up forms are due back ASAP! If you need a form, please let me know. Field Day T-shirt orders are due Monday, April 15th. We will wear them on our end of the year field trip. School will dismiss at 1pm on Friday, April 12th. There will be no school on Friday, April 19th & Monday, April 22, 2019 for Easter Break. Preschool will be assembling and delivering May Day baskets on Wednesday, May 1st to businesses in the community. We will make them in the morning and deliver them at 2:30pm. We usually fill little baskets or bags with office supplies and candy. On Tuesday, May 14th we will be going on our end of the year field trip to Kaleidoscope and Lego Land. I will send home more information and details at a later date. 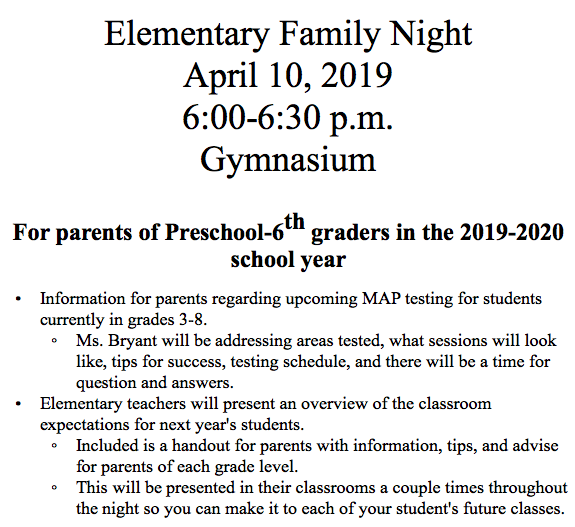 child is going to Kindergarten next year, please have your child in the preschool room by 5:45 p.m.